Guys if you want to say something to your love one s, family and friends abroad start it now with Smart’s international texting promo called iText-A-Lot 30. For as low as 30 pesos your texts can reach to foreign countries with a validity of 24 hours. By just reloading your Smart prepaid SIM account with 30 pesos, you can send and reply up to 100 text messages. Affordable right? Only 0.30/text to over 55 destinations that includes country in Middle East like Saudi, UAE, Kuwait and Asian countries like Singapore, Malaysia, Indonesia and more. How to register iText-A-Lot 30, text abroad promo? 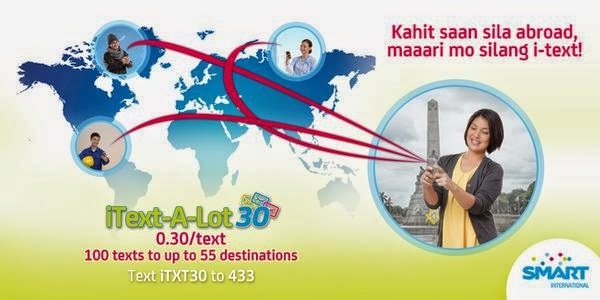 How to send international text with iText-A-Lot 30 promo? Create your message then send to using this number format 8989+Country code + Area code + Recipients’ number. You can now start texting abroad using this promo, if you want call abroad promo from Smart you can check out Talk A Lot IDD and Flexi Call and Text . For validity and updates you can always check Smart’s website and follow their social media accounts. Nakakasend ba siya ng text to other sim sa other country?